This chest x-ray shows coal worker's lungs. There are diffuse, small, light areas on both sides (1 to 3 mm) in all parts of the lungs. 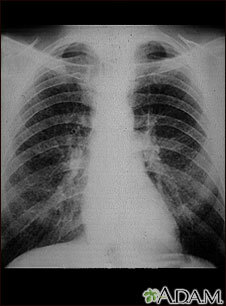 Diseases that may result in an x-ray like this include: simple coal workers pneumoconiosis (CWP) - stage I, simple silicosis, miliary tuberculosis, histiocytosis X (eosinophilic granuloma), and other diffuse infiltrate pulmonary diseases.